Released today, Malaysia’s industrial production grew more than expected by 3.4% year-on-year in December, up from 2.6% growth in November (revised from 2.5%). The outcome was slightly short of our 3.5% growth forecast but way better than 2.7% consensus estimate. 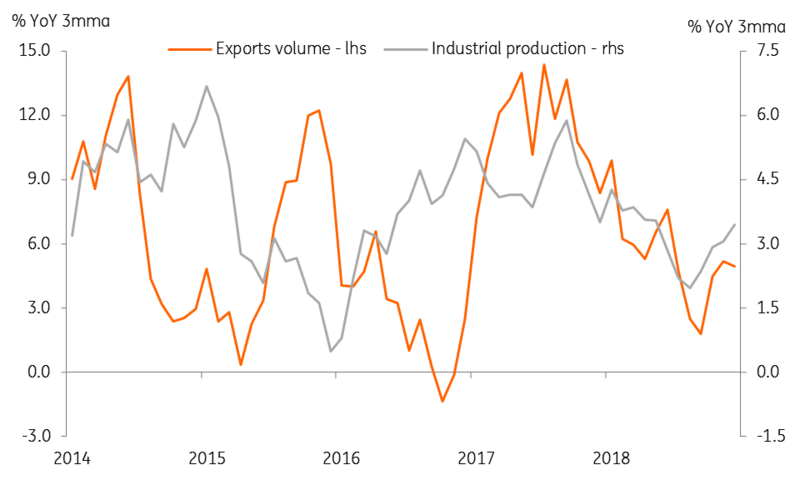 Our above-consensus estimate relied on firmer exports, especially electronics exports which have held up well in the face of a slowdown elsewhere in the region (Korea, Taiwan, Singapore). Among the other activity indicators released alongside the production data, manufacturing sales growth eased slightly (7.5% in December vs. 7.7% in November) and employment growth slowed too (1.7% vs. 2.0%), yet salaries improved (10.1% vs. 9.0%). Industrial production growth closely tracks manufacturing GDP growth. At an average of 3.5% in the final quarter of 2018, IP growth accelerated from 2.3% in the third quarter. The growth of real manufacturing sales (deflated by the consumer price index), which loosely tracks services GDP growth, was steady around 8% over these periods. This is consistent with our view of an acceleration in GDP growth over the period to 4.6% year-on-year from 4.4%. The release of the 4Q18 GDP data is scheduled for Thursday, 14 February. On the expenditure side, a positive contribution from net trade supported the acceleration of GDP growth in 4Q18. However, strong wage growth combined with low inflation likely sustained private consumption as the main GDP driver. This leaves government consumption and investments as possible weak links in the economy following restraints on public spending and the suspension of some infrastructure projects under the new government. 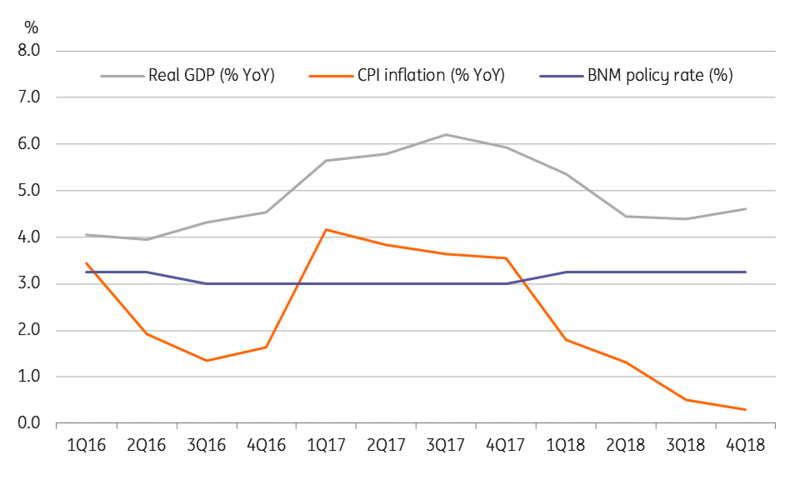 We think the central bank (BNM) considers the economic risks fairly balanced between growth and inflation and will leave monetary policy on hold throughout 2019. The potential of a softer US dollar following a dovish turn in the US Federal Reserve's policy and firmer oil prices will be positive for the Malaysian ringgit (MYR). The 1.6% year-to-date MYR appreciation against the US dollar puts it among Asian outperformers so far this year. We see the USD/MYR rate hovering around 4.10 for most of the year.